In a Nutshell: Brett Moffitt wrapped up the 2018 NASCAR Camping World Truck Series championship by taking the victory in Friday night’s Ford EcoBoost 200 at Homestead-Miami Speedway. The driver of the No. 16 Toyota won by two seconds over polesitter Grant Enfinger, who led 33 laps. Noah Gragson finished third on the track and second in the championship battle. Stewart Friesen and Sheldon Creed rounded out the top five. Just a week after being eliminated from title contention, Matt Crafton ended up sixth, followed by John Hunter Nemechek. Justin Haley ended the race in eighth while finishing third in the championship standings. Jesse Little and Ben Rhodes rounded out the top 10.
Who Should Have Won: Moffitt started fifth, worked his way to third by the end of stage one and just a handful of laps after stage two began, he took the lead for the first time on lap 40. He held onto the top spot through the end of the yellow that followed the conclusion of stage two before relinquishing it to Gragson. By the time the checkered flag flew, Moffitt had led three times for a race-high 59 laps, including the final 29 circuits following a round of green-flag pit stops en route to his sixth win this season. GMS Racing teammates Johnny Sauter and Justin Haley gave the organization a 50-50 shot of winning the championship by both qualifying for the Championship 4, but by the time the checkered flag flew, both drivers came up short. Sauter qualified sixth but almost immediately struggled with a loose truck after the green flag flew. By the time the end of stage one rolled around, he had faded back to 13th. Crew chief Joe Shear Jr. threw a plethora of changes at the No. 21 Chevrolet in hopes of making the difference his driver needed to score a second championship, but instead, Sauter struggled to a disappointing 12th-place finish. “We just missed it. I never would’ve thought we’d be that bad,” Sauter said. “Just want to apologize to all the guys at GMS, they deserve better than that for sure. We were just sideways loose. We were dropping the track bar, putting rubbers in the left rear, the balance was just never there. Even if we could get it tight enough, we would just start chattering the front tires across the center and still snap loose one exit. Meanwhile, teammate Haley sniffed the lead early, though he never officially led a lap, and he never really had enough speed to compete for the win or the championship. “We had a good run at it there at the start of the race,” Haley explained. “I thought we were going to be one to contend for. We had really good fire-off speed all night, and seemed like four or five laps into the run, we would plow tight and then get loose, and about 13, 14 laps into the run we’d get okay again. We just fought balance all night, but still a pretty good day. Haley ended up seventh when the checkered flag flew and third overall in the championship standings. In just his second Truck Series season, Noah Gragson set himself up for a run at the championship at Homestead-Miami Speedway, and had the field been tightened up late in the season finale, it’s possible he could have pulled it off. 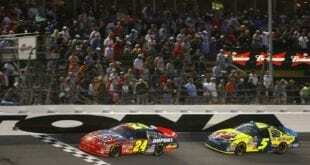 In fact, he led 34 laps earlier in the race and engaged in a spirited battle with eventual champion Moffitt. 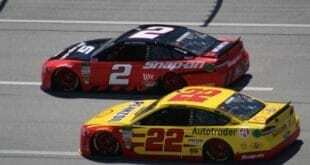 But about midway through the final stage, a suspected flat tire sent him down pit road, and that, combined with a tight-handling truck and a long green-flag run to close out the race, left him to settle for this on the track and runner-up in the championship battle. “We were just tight there. We needed to make better adjustments on pit road. That’s where it comes down to me. I need to do a better job,” Gragson said. 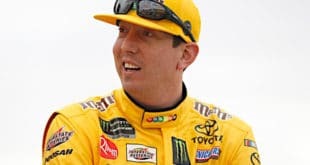 “On the bright side, racing for a championship, I never would have dreamed of that when I started racing six years ago that I’d be in this position with Kyle Busch Motorsports and Safelite AutoGlass, Toyota, Switch, everybody who helps me. “It’s my last truck race with Kyle Busch Motorsports. Man, I wanted to go out on top, but it just wasn’t meant to be. It’s just a bummer, but hey, no bad days, right? We’re going to move on to the next year in the XFINITY Series. I’m pumped up about that, but this one is going to hurt for a while. Just very thankful. “Devastated for my guys. They worked really hard. This one would have been for them. I give all of my credit to Rudy Fugle (crew chief), Kyle Busch Motorsports and everybody else who helps me out at Kyle Busch Motorsports. For Gragson, it’s only the beginning of his NASCAR career. 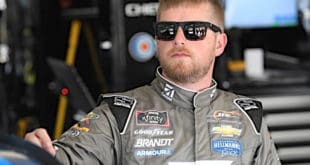 As he hangs up his KBM helmet, he’ll join JR Motorsports next season to run the full XFINITY Series campaign, replacing the retiring Elliott Sadler. In fact, he’s already started looked ahead to the 2019 season. Gragson made three starts earlier this season in the XFINITY Series, including a runner-up result in his debut race at Richmond Raceway. 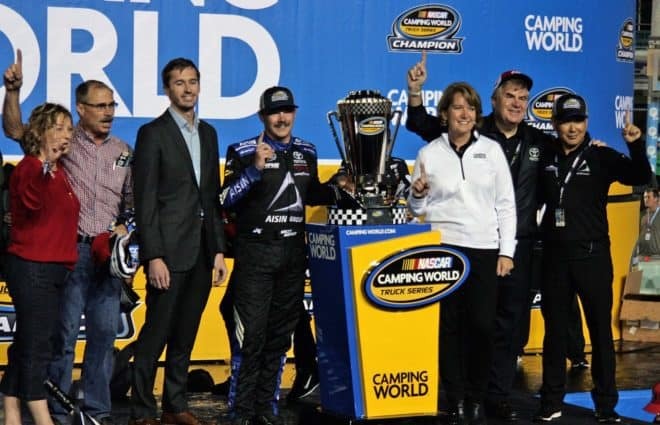 If you had told Brett Moffitt and the Hattori Racing Enterprises team a little over six months ago that they would win the championship at Homestead-Miami Speedway, there may have been a little skepticism. It’s not that they didn’t believe. Instead, sponsorship was an issue and quite a bit of uncertainty. “We all know the story by now where we didn’t know if we were going to race the full year. I didn’t know if I was going to have the opportunity to compete for a championship even after we got our first win. Everyone pulled together hard here. But somehow, the organization managed to piece together the financial backing needed to keep itself eligible for the championship battle. For HRE, it’s redemption. Remember, just two seasons ago, the organization started the 2016 season intent on running the full schedule with Ryan Truex, only to be sidelined due to a lack of sponsorship. Last year, HRE entered the season with sponsorship already in place and nearly made the playoffs with Truex. Fast forward to the 2018 season and HRE is celebrating its first championship. Myatt Snider quietly closed out his rookie season with a 14th-place finish. But that, combined with his performance throughout the season, was enough for the driver of the No. 13 Ford to win Rookie of the Year honors. With 32 trucks in the field for the season finale, the 2018 season stands as the first one since 2005 that every single race featured a full field. In fact, a late entry meant that the No. 83 Chevrolet ended up withdrawing from the event. Sure, there have been a handful of start-and-park efforts, but most were second trucks for teams just trying to make ends meet. While there are still problems in the series that could be fixed, it’s refreshing to see that they’re putting full fields together on a regular basis. The series has run its final race as the Camping World Truck Series. When drivers take the track in the season-opener at Daytona International Speedway in February, it will be re-branded as the Gander Outdoors Truck Series. Sheldon Creed scored a career-best fifth-place finish Friday night. He started 13th and managed to work his way through the field for his first top five. It’s a solid end to a handful of races he ran to close out the 2018 season ahead of joining GMS Racing full-time for the 2019 campaign. Came up 1 spot short of winning the @NASCAR_Trucks championship but most importantly I had a good time. Thank you everyone who supports me, along with @safelite @KBMteam and @ToyotaRacing. Content Director Beth heads up management of our 30-person staff, acting as Tom’s main assistant with technology and personnel while working as Frontstretch’s Truck Series expert. The author of Truckin’ Thursdays and the coordinator of the site’s pre and post-race coverage, she also runs a periodic charity column that spotlights when NASCAR gives back. A childhood transplant to Texas, Beth is a 13-year writing veteran who has contributed content to BRANDT and Athlon Sports, among other outlets.